M. Aurelius Carinus, the elder son of Carus was associated with his father in the government, A.D. 283 and remained in the west, while his father and brother Numerianus proceeded to the east to carry on war againt the persians. Obverse: CARINVS NOBIL CAES, Radiate and cuirassed bust right. 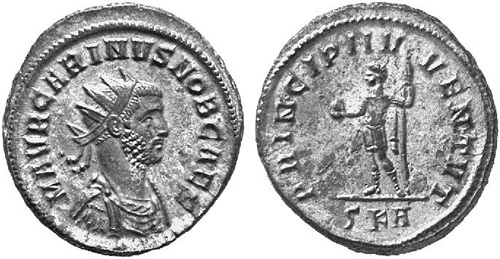 Reverse: PRINCIPI IVVENTVT, Carinus standing right, holding globe in right hand, sceptre in left. C in left field. Obverse: CARINVS NOBIL CAES, Radiate and cuirassed bust left, holding spear over shoulder and round shield decorated with gorgoneion motif. Obverse: CARINVS NOBIL CAES, Radiate, draped and cuirassed bust right. 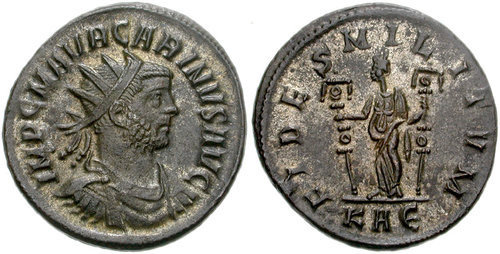 Reverse: PRINCIPI IVVENTVT, Carinus standing right, holding globe in right hand, ensign in left. C in left field. Obverse: CARINVS NOBIL CAES, Radiate, draped, cuirassed bust right. 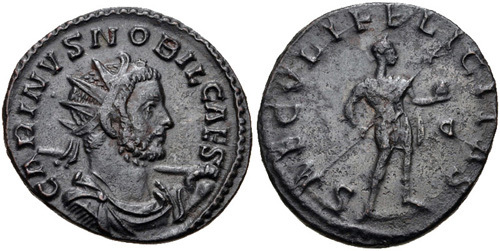 Reverse: SAECVLI FELICITAS, Carinus standing right with globe and spear, D in right field. Obverse: CARINVS NOBIL CAES, Radiate, draped, and cuirassed bust right, holding spear over shoulder. Reverse: SAECVLI FELICITAS, Carinus standing right with globe and spear, D retrograde in right field. Obverse: CARINVS NOBIL CAES, Radiate and cuirassed bust left, holding shield and spear over shoulder; gorgoneion on shield. Obverse: M AVR CARINVS NOB CAES, Radiate, draped and cuirassed bust right. Reverse: PIETAS AVGG, Sacrificial implements : sprinkler, simpulum, jug, patera, knife and lituus; KAZ in exergue. Obverse: M AVR CARINVS NOB C, Radiate, draped, cuirassed bust right. Obverse: M AVR CARINVS CAES, Radiate, draped, and cuirassed bust right. Reverse: PRINCIPI IVVENTVT (or IVVENT), Prince standing left holding ensign and sceptre, KAE in exergue. Obverse: M AVR CARINVS NOB C, Radiate cuirassed and draped bust right. Reverse: PRINCIPI IVVENT (or IVVENTVT), Prince standing left holding ensign and sceptre, KAE in exergue. 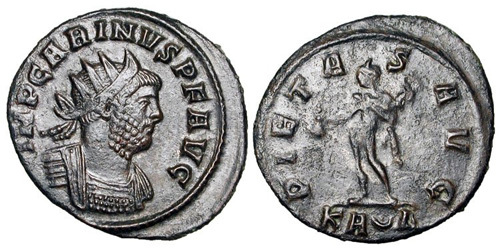 Reverse: PRINCIPI IVVENTVT (or IVVENT), Carinus standing left holding globe and sceptre, SKA in exergue. Obverse: M AVR CARINVS NOB C, Radiate, draped and cuirassed bust right. 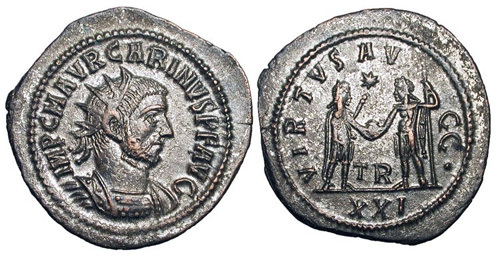 Reverse: PRINCIPI IVVENT, Carinus standing left, holding ensign and sceptre. Mintmark : VIXXI. 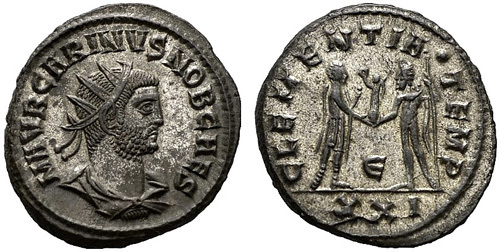 Reverse: PRINCIPI IVVENTVT, Carinus standing left, holding globe and spear; captive seated to left; QXXI. Reverse: PAX AVGVSTI, Pax walking left holding olive branch and sceptre. Mintmark: T in right field/XXI. Obverse: M AVR CARINVS NOB CAES, Radiate, cuirassed bust right. Reverse: PRINCIPI IVVENT, Prince standing left, holding baton and spear. Mintmark : star and T to right, XXI in exergue. 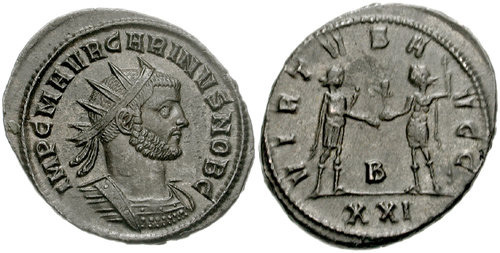 Reverse: PRINCIPI IVVENT, Carinus standing left holding baton and transverse spear, star left, two standards right, XXIT in exergue. 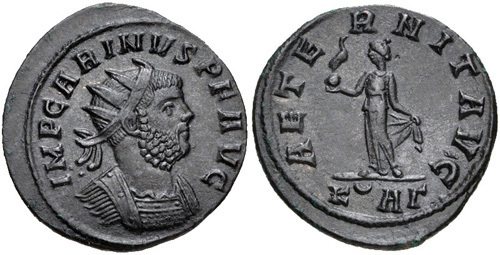 Reverse: CLEMENTIA TEMP, Carinus standing right receiving Victory on globe from Jupiter standing left, holding sceptre. Mintmark E between, XXI. Obverse: IMP C M AVR CARINVS NOB C, Radiate and cuirassed bust right. 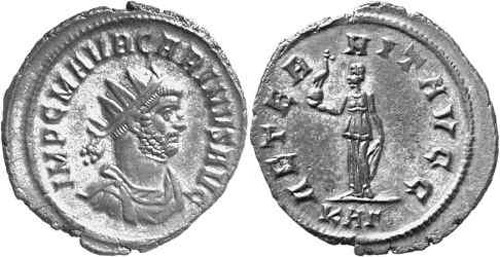 Reverse: VIRTVS AVGG, Carinus standing right, holding sceptre and receiving globe, with or without Victory, from Carus, standing left, holding sceptre. Mintmark : B in center; XXI. Obverse: IMP M AVR CARINVS NOB C, Radiate and cuirassed bust right. 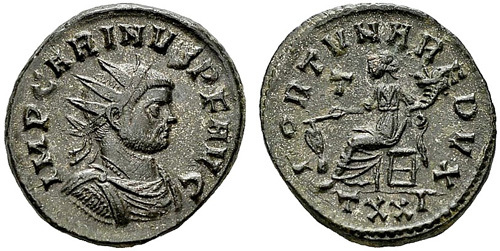 Reverse: VIRTVS AVGG, Carinus standing right, holding sceptre, receiving globe from Jupiter (or Carus) standing left, holding sceptre; star above, TR between. Mintmark XXI. Obverse: IMP C M AVR CARINVS AVG, Radiate, draped and cuirassed bust right. Reverse: AEQVITAS AVGG, Aequitas standing left, holding scales and cornucopiae, A in right field. Obverse: IMP CARINVS P F AVG, Radiate and cuirassed bust left, holding sceptre over shoulder and shield with head of Gorgon. Reverse: SAECVLI FELICITAS, Emperor standing right holding spear and globe, D to right, sometimes LVG in exergue. Reverse: SALVS AVGG, Salus standing right, feeding serpent held in arms. Obverse: IMP CARINVS P F AVG, Radiate, draped and cuirassed bust right. Reverse: VICTORIA AVGG, Victory advancing left holding wreath and palm, A to left. Reverse: VIRTVS AVGG, Virtus standing right, holding reversed spear and parazonium; A//LVG. Obverse: IMP CARINVS P F AVG, Radiate and cuirassed bust right. Reverse: AEQVITAS AVG, Equity standing left, holding scales and cornucopia. Mintmark: KAZ. Obverse: IMP C M AVR CARINVS P F AVG, Radiate, draped and cuirassed bust right. Reverse: AEQVITAS AVGG, Equity standing left, holding scales and cornucopia. Mintmark: KAZ. Reverse: AETERNIT AVG, Aeternitas standing left, holding phoenix on globe and lifting robe, K crescent AG in exergue. Reverse: AETERNIT AVGG, Aeternitas standing left, holding phoenix on globe and lifting robe. Mintmark: KAG. Reverse: FIDES MILITVM, Fides standing left holding two standards, KAE in exergue. Reverse: GENIVS EXERCITI, Genius standing left, holding patera and cornucopiae, KAA in exergue. Obverse: IMP C M AVR CARINVS AVG, Radiate, draped, and cuirassed bust right. Obverse: IMP CARINVS P F AVG, Radiate, cuirassed bust right. Reverse: IOVI VICTORI, Jupiter standing left, holding Victory and scepter; eagle to left, at foot. Mintmark: KA(crescent)B. Reverse: LAETITIA FVND, Laetitia standing left, holding wreath and rudder. Mintmark: KAGamma. Reverse: ORIENS AVG (or AVGG), Sol advancing left or right, raising hand and holding whip or globe. Mintmark: KA(pellet within crescent)S.
Reverse: PIETAS AVG (or PIETA), Mercury standing left holding purse and caduceus, KA dot in crescent Delta in exergue. Obverse: IMP C M AVR CARINVS P F AVG, Radiate draped and cuirassed bust right. Reverse: VIRTVS AVGG, Mars walking right, holding spear and shield. Mintmark KAE. Reverse: VIRTVTI AVGG, Hercules standing right, leaning on club and holding bow and lion's skin. Mintmark: KAZ. Reverse: FELICIT PVBLICA (or FELICI or FELICITAS), Felicitas standing left with cauduceus, leaning on column, QXXI in exergue. Reverse: FORTVNA REDVX (or RED), Fortuna seated left, holding rudder and cornucopiae. Mintmark: TXXI. 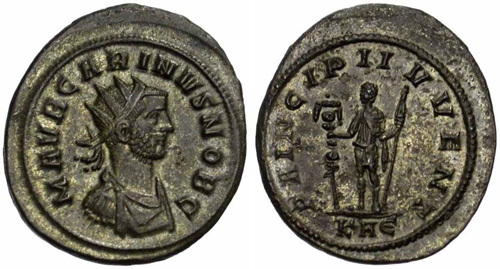 Reverse: PRINCIPI IVENTVT, Carinus standing left, holding globe and spear; seated captive to left. Mintmark TXXI. Obverse: IMP C M AVR CARINVS P F AVG, Radiate and cuirassed bust right. Reverse: IOVI CONSER, Emperor standing right, holding spear or sceptre and receiving globe from Jupiter (or Carus) standing left, holding sceptre. Mintmark: B/SMSXXI. Reverse: VIRTVS AVGG, Carinus and Numerian holding Victory on Globe. Mintmark: B/XXI. 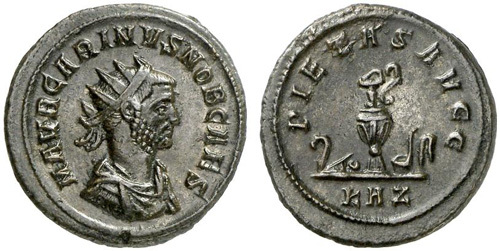 Reverse: VOTA PVBLICA, Carinus and Carus standing, facing each other, sacrificing over altar; two standards in background. Mintmark SMSXXIB. Obverse: IMP C CARINVS P F AVG, Radiate and cuirassed bust right. Obverse: IMP M AVR CARINVS P F AVG, Radiate and draped bust right. Reverse: CLEMENTIA TEMP, Carinus standing right, holding sceptre and receiving Victory from Jupiter standing left, holding long sceptre. Mintmark: Gamma/XXI. Obverse: IMP M AVR CARINVS P F AVG, Radiate, draped and cuirassed bust right. Reverse: CLEMENTIA TEMP, Carinus standing right, holding sceptre and receiving Victory from Jupiter standing left, holding long sceptre. Mintmark: Delta/XXI. Reverse: VIRTVS AVGG, Carinus standing right, holding sceptre, sometimes surmounted by eagle, receiving Victory, with or without globe, from Jupiter (or Carus) standing left, holding sceptre. E//XXI. Reverse: VIRTVS AVGG, Carinus standing right, holding sceptre, sometimes surmounted by eagle, receiving Victory, with or without globe, from Jupiter (or Carus) standing left, holding sceptre. B//XXI. Reverse: VIRTVS AVGGG, Carinus standing right, holding sceptre, sometimes surmounted by eagle, receiving Victory, with or without globe, from Jupiter (or Carus) standing left, holding sceptre. S//XXI. Reverse: VIRTVS AVGG, Carinus standing right, holding sceptre, sometimes surmounted by eagle, receiving Victory, with or without globe, from Jupiter (or Carus) standing left, holding sceptre. TR in lower centre, XXI in exergue.